Don't you hate it when you're drinking your tea and pterodactyls swarm while a flying saucer abducts you? Designer Dan Moyer is releasing a gorgeous mug that at first just seems to be a fine work of blue willow China. Look closely, however, and you'll see that the Things-Could-Be-Worse mug is a horrifying illustration of disaster upon disaster: the robot takeover, Bigfoot running amok, and so much more. 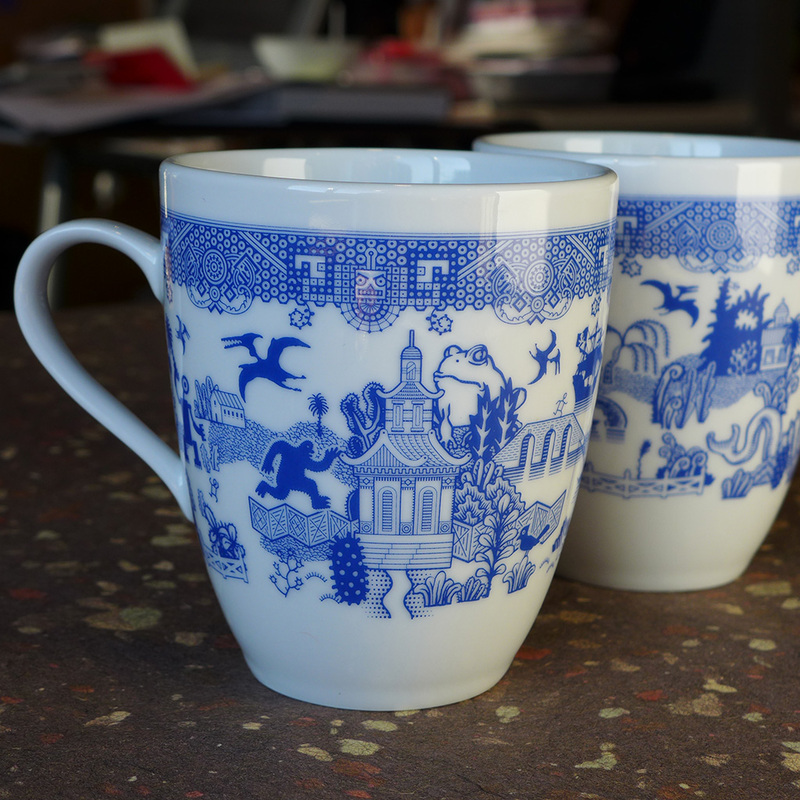 The Things-Could-Be-Worse mug is part of Moyer's kitchenware collection, Calamityware. Before T-C-B-W, Calamityware's kitchen line only included plates. The six plates for sale each depict a different disaster, ranging from a flying monkey attack to a volcano eruption. The mug is the first item to include a wicked abundance of disasters all at once, lest anyone survive the boiling lava. Things-Could-Be-Worse began, like all of Moyer's products, as a Kickstarter. Shooting for $25,000, Moyer ended up raising just shy of $265,000. In his campaign, he explained that T-C-B-W mugs have "the power to change the way you think…everyone has bad days sometimes, right? You lose your keys, you lose your job, you lose your super powers." On those days, it's important to remember that at least you're not being eaten alive by cephalopods. The Things-Could-Be-Worse mug is sturdy porcelain, food safe, and microwave safe. You can preorder a set of four for $48 at Moyer's site, and you can follow Moyer's hilarious illustrations on Flickr.